If you’ve been writing for a while, you probably have songwriting friends; you listen to one another, critique constructively, co-write, commiserate, and simply find encouragement in knowing others who are on the same strange path. Yes, there are famous “lone wolf” writers, but most of us find that our skill levels rise with every encounter with other songwriters. NSAI (Nashville Songwriters Association International) is one among several formal groups with much to offer, and not only for those with Music Row ambitions. Look around – you’ll find a circle that works for you. 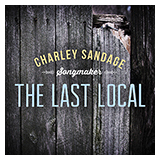 Falling squarely into the Americana category, and mostly acoustic, “The Last Local” features a new selection of my original songs and the instrumental work of the inimitable Tim Crouch, from nearby Strawberry, Arkansas, who played fiddle and did the charts for Alan Jackson’s recent bluegrass album. Some of the songs were written decades ago, and some are only months old. Casey Penn contributed harmonies, and Brad Apple recorded and mixed the final stages. Three are co-writes, one each with Robert Rivers, Doug Deforest, and Connie Mims. They are songs of celebration, storytelling, recollection, and reflection.